You probably don’t have to develop a hankering for chocolate, but perhaps you might need to develop a perspective for humour? Either way, we’d got something for you today with two delicious topics! Author of Chocolatour, A Quest for the World’s Best Chocolate, Doreen Pendgracs shares everything you ever wanted to know about chocolate. Including some shocking effects on women (chocogasm anyone??). A-hem. Anyway… Doreen pretty much guaranteed herself a return interview by bringing chocolate from India into the radio studio, complete with a lesson on how to eat it, err… rather how to savour it! Let a piece of chocolate rest for a short time on your tongue and then stick it to your upper palate. Tickle the chocolate with your tongue so that it slowly begins to melt. Good chocolate has great staying power. This means you will feel the aromas for some time after you have eaten the chocolate. Wow, chocolate will never be the same again! As if that wasn’t enough, Mike Kerr joined us too and although he didn’t bring chocolate (I shall expect it next time I see you Mike) he had important (and funny) information to share. Mike is a Hall of Fame international business speaker who travels the world researching, writing, and speaking about inspiring workplaces and the power of humour to create outrageous results. 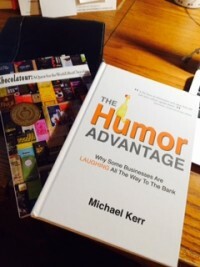 Michael’s latest book is called, The Humor Advantage: Why Some Businesses Are LAUGHING All the Way to the Bank! 1. Create rituals and traditions. Great workplaces thrive on traditions because they give employees something to look forward to and they build a sense of shared history. It might be a ritual to kick off the work day/week, a ritual that gets everyone reenergized when the “3 p.m. blahs” hit, or something that celebrates a major sale or milestone in a fun way. 2. Create – as some companies have done – a rotating corporate jester position or culture squad whose job it is to identify and promote fun, culture-building activities. 3. Start a team humour file or book where you collect funny customer questions and humorous, work-related material. A humour file reminds everyone sharpen their humor saw and it serves as a repository for material that you can share during meetings, on your intranet site, or on a humor bulletin board. 4. Celebrate fun theme days, such as International Talk Like a Pirate Day (September 19) or Make Up Your Own Holiday Day (March 26). Or create your own offbeat theme days, such as Third Person Thursdays where everyone refers to themselves all day in the third person. 5. From a “Queen of Fun and Laughter” to a “Director of First Impressions,” many companies are creating fun, alternative job titles for employees that celebrate the true nature of their work. 6. Reward people for their stress in a fun way: Offer a fun prize for whoever has to deal with the most obnoxious customer of the week or a “bonehead play of the month” award to whoever admits to making the biggest “oops”. 7. Humor drives creativity, so make sure your meetings are fun. Add a humor break to the middle of a long meeting, kick off your meetings with a fun tradition, or add a rumour mill section to encourage open communication in a fun way. Stephanie Staples, CSP* is the author of When Enlightening Strikes – Creating a Mindset for Uncommon Success, an internationally acclaimed motivational speaker, and the recipient of the 2014 Manitoba Woman Entrepreneur Award for Contributions to Community. Stephanie empowers audiences & clients across North America to bring their ‘A’ game to work and to life. Stephanie has a special interest in working with and empowering nurses and healthcare providers. She happily calls Winnipeg, Manitoba, Canada home. You can get loads of complimentary resources to help with issues such as work/life balance, wellness, stress management, resiliency and happiness in general, as well as find out more information about her coaching and speaking services at http://www.YourLifeUnlimited.ca. This entry was posted in Blog, Happiness, Motivation, Personal Growth, Positivity, Stress Management, Work/Life Balance and tagged cjob, positvitiy, Stephanie Staples, Your Life Unlimited. Bookmark the permalink. Previous Previous post: Making Mealtimes Rock!